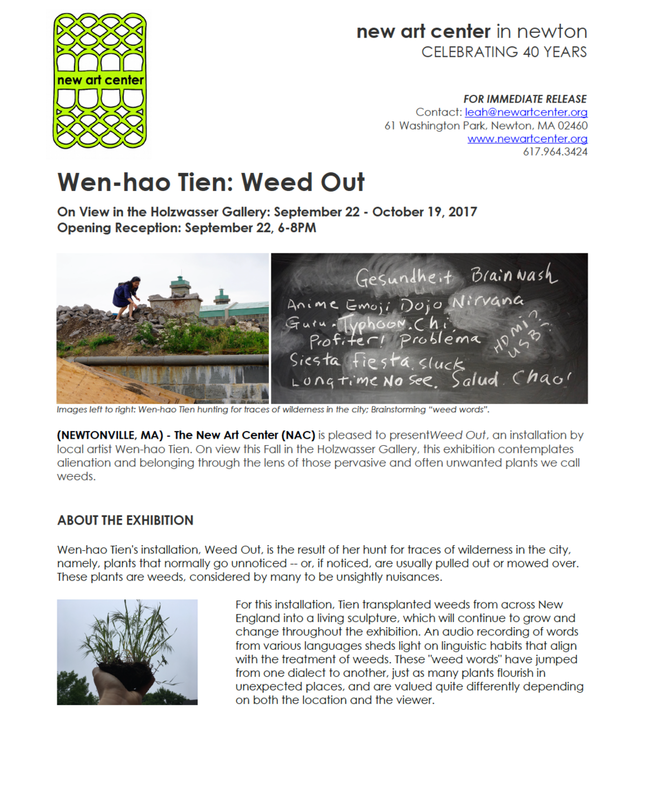 Soon after Labor Day, common weeds will be carted to the New Art Center in Newton to be sculpted into an island in the center of its spacious Holzwasser Gallery. When the full spectrum lights are thrown on for the month-long exhibit’s September 22 opening — the brainchild of installation artist Wen-hao Tien — the culmination of the artist’s vision will shine in all its various weedy hues, forms and heights. And then begin to shift and shake — but more of that later. Right now, I want to question my use of the word “brainchild” — easy but not felicitous. Although Tien has led a decades-long career as an academic in Asian and international studies, first at Harvard University and recently at Boston University, her guts, her passion and her sensibility have been for hire at least as much as her brain — that late, seemingly after-thought addition to mankind’s short, short evolutionary history on our old Earth. After all, would anyone in their “right mind” use up precious hours of a busy life leading a fourwheeled “buggy” up and around the highways and byways of a diverse Cambridge neighborhood bordering the high-tech environs of MIT’s Kendall Square? Not likely. Which is why the curious often edge up to peek over the borders of Tien’s wagon to spy an interior of rich earth and carefully spaced, lovingly transplanted weeds. And then, often a dialogue of questioning and listening will evolve. Brainy, gutsy, passionate — and even sometimes skirting the edges of a sense common to both participants — weeds do, indeed, have something to say to us, their highly-bred cousins. 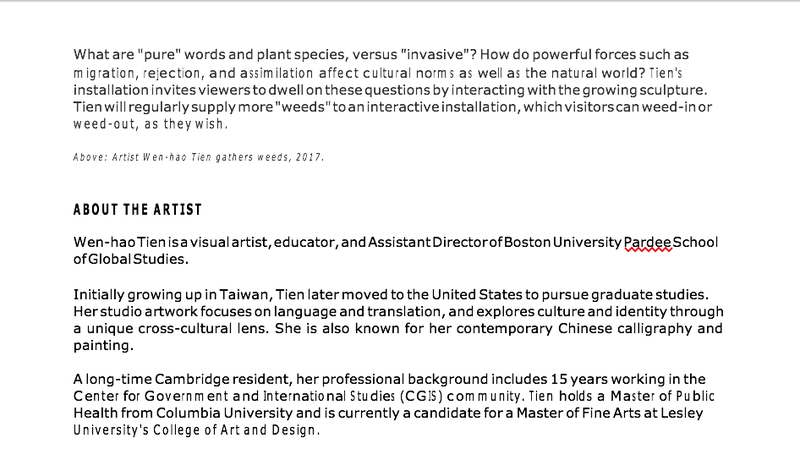 Which is why, when you go to see Tien’s island of weeds at the New Art Center in Newton, you might decide to, and be welcome to, add to the majesty of the artist’s finished island one or two carefully root-wrapped weeds, waiting off to the side in a “buggy” — and thus to “unfinish” or continue the dialogue in another direction. Tien herself is used to grasping different directions that, like weeds, seem to appear out of nowhere and challenge one to grasp them and hang on and root down for better or for worse. Her ancestors had been landowners in China for centuries when suddenly the last emperor, court and all, disappeared into a crack in history early in the last century. It was a mighty crack in history that sent up smoke and fire and destruction, until in mid-century Mao’s Communists expelled all the lesser powers to find willy-nilly, like free-floating seeds, more hospitable soil. Enter Taiwan and, come the 1960s, enter Wenhao Tien. Taiwan’s educational authorities sorted her and other “brainy” students early on to a bio-medical science track, but when she emigrated to the States to set down roots in Manhattan, she felt like she was thinking with half her brain. Meanwhile, at a high-powered symposium at Harvard’s Center for Government and International Studies, brainy scholars from different parts of Asia — even from different regions of the same country — were turning to each other with unhealthy dollops of mutual incomprehension. Enter, once again, Tien, with her brainy/scrappy refugee/scholar sensibility, to suss out the nuances between supposedly similar “Asians” before they sprouted into thorny fences. Seating, as any good host knows, is important. As are places to mix. Sometimes, as she was doing more and more in her studio at home, she drew pictures to counter the confusions of different languages and even different dialects of the same language: imaginative diagrams to help words cross cultures. By now, Tien was not the hot-house bloom the educational authorities in Taiwan had long ago determined that she should be. And, as she looked around, she determined, with new focus, that neither scholars nor peasants were hot-house blooms. In fact, didn’t even “hot-house blooms” themselves have wild and “weedy” beginnings that were smaller, certainly less spectacularly eye-catching, but full of the inflections that enable them to grow and survive in the most diverse settings? Like her, or me, or you. Tien seems to enter a slower time, a wider attention span, as she examines a weed she has carefully procured from a nearby urban crack or Charles River bank. At first, I humor her, and then I’m absorbed in a delicate stem formation that she tells me, with a tone appropriate to headline news, that this vital formation was not apparent even a short three weeks ago. She will be adding plants each of four weekends as the old-timers naturally fade into a changing exhibit that you, if you choose, will have a hand in altering. Summon your inner weed, every part, to enter, to re-enter, an old, old family, both alien and as familiar as next door, at the New Art Center this fall.